Components for two Apollo Saturn V F-1 rocket engines recovered from the Atlantic Ocean by Jeff Bezos, founder and CEO of Amazon.com and the commercial spaceflight company Blue Origin arrived on shore in Cape Canaveral, Fla., on March 21, 2013, after being lost at sea for more than 40 years. Returning to Cape Canaveral for the first time since they were used to launch a giant Saturn V moon rocket, the recovered parts from two colossal F-1 engines arrived on shore Thursday (March 21) after more than 40 years spent lost at sea. 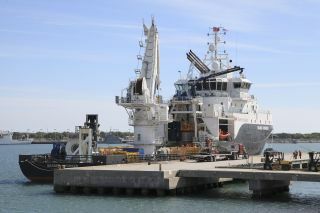 Amazon.com founder Jeff Bezos led the private expeditionthat recovered the F-1 engine components, which arrived at the Florida port aboard the multi-purpose vessel Seabed Worker. During their three weeks at sea, the ship's crew worked with remotely operated submersibles to lift the historic space artifacts off the ocean floor from a depth of more than 14,000 feet (4,270 meters) below the surface. Five F-1 engines were used to power the Saturn V rocket's first stage, which lifted the mighty booster off the launch pad. After firing for nearly three minutes, the F-1 engines were jettisoned and together with the spent first stage fell from a height of about 40 miles (64 kilometers) into the ocean. The force of impacting the water tore the engines apart before the twisted parts sank to the seafloor. Bezos revealed that his expedition had successfully raised enough parts for two engines in an update posted Wednesday (March 20) to the project's website. When intact, the massive engines stood 18.5 feet tall (5.6 m) and 12.2 feet wide (3.7 m). Thirteen Saturn V rockets, with a total of 65 F-1 engines, lifted off on NASA's Skylab and Apollo missions to Earth orbit and the moon between 1967 and 1973. Workers unload parts for two Apollo Saturn V F-1 rocket engines recovered from the ocean floor by a private expedition led by Jeff Bezos, founder and CEO of Amazon.com and the commercial spaceflight company Blue Origin. According to Bezos, it is not yet clear on what mission the two engines his team recovered flew. Now on land, the rocket engine parts will undergo a restoration effort to halt the corrosive effects of the ocean's water and prepare them for public display. The parts, including those still at the bottom of the ocean, remain NASA property. The space agency has agreed, however, to work with Bezos to exhibit the restored engines. Though no decisions have been made yet, NASA and Bezos earlier proposed the recovered F-1 engines be displayed at the Smithsonian's National Air and Space Museum in Washington, D.C. and at The Museum of Flight in Seattle. Click through to collectSPACE.com for more photos of the Apollo F-1 engines recovered by Amazon.com’s Jeff Bezos arriving on shore at Cape Canaveral.